One of the biggest challenges facing all corporate executives when planning any corporate outing is to find the perfect blend between controlling too much of the employees/guest’s time and not having any time to communicate, or bond with them. 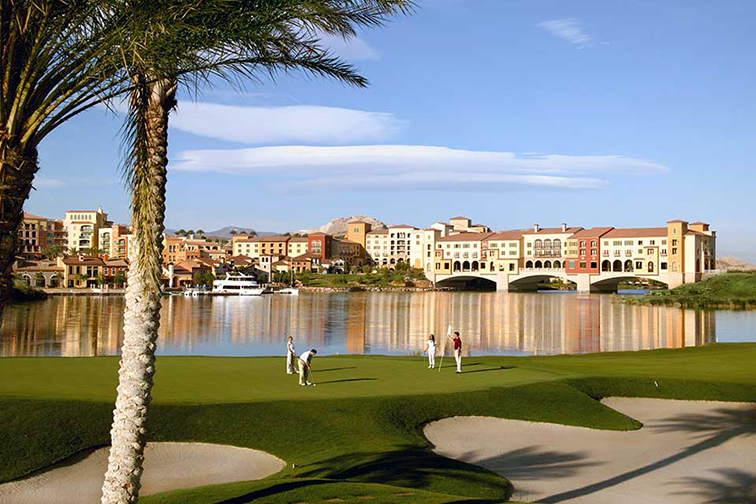 Reflection Bay Golf Club and the Westin Lake Las Vegas Resort have created the perfect blend of molding both scenarios. Hotel: our hotel and golf course are isolated from the hassle and crowded activities of the Las Vegas Strip, yet we are only 20 minutes from the Strip. Retreat from the neon lights of the Las Vegas Strip to a lakeside paradise at our Lake Las Vegas hotel where the only item on your itinerary is relaxation. Unwind at our new spa to enhance your ultimate time away from work. Reflection Bay Golf course, your home for Championship Golf, is one of Jack Nicklaus’ masterpiece designs and is set around luxurious Lake Las Vegas, a 320 acre man-made lake. In addition to the challenge of holes created by the natural environment, Jack has added an ambiance of a private white sand beach and a unique experience in the golfing world, a floating concert stage. Reward your employees with a Fun-Filled outing away from the drudgery of room packed drawn-out meetings. -The Westin Lake Las Vegas Resort and Spa, your luxury corporate retreat, features a relaxed environment that promotes better communication with your staff and/or clients and offers the perfect blend of business with pleasure.